This week’s bracelet was pure indulgence. I wanted to make something featuring my new starfish color, aqua blue, and I wanted it to be fun and easy to create. I needed a simple, carefree design. 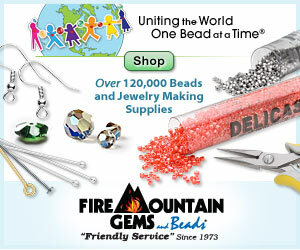 I can’t think of anything more carefree than freeform beadwork. The only style that I’m comfortable with is netting, which is easy to work, but has enough limits and boundaries that I still know what I’m going to get in the end. It’s also very aquatic and nautical, so it fits well with starfish. And since I really enjoy throwing lots of different beads together, I couldn’t resist. In order to make blue starfish stand out, and look right at home, I created a palette that would look just like a white sandy beach - the kind that hasn’t been cultivated, polluted or in any way touched by humans. It would be imperfect, varied, and totally beautiful. So I started by mixing 11/o and 8/o seed beads in opaque white, lustered white, ceylon black/gray, light beige, and dark beige. For accents, I went all through my bead stash and picked out beachy pieces, and assorted odds and ends that I might want to throw into a freeform piece. I began with pinch bicones in turquoise, crystal, and green meadow, frosted magatamas, the last of my pink shell beads and a few other bits of shell, just in case. Almost immediately after I got to work on the bracelet, I omitted the turquoise and green beads from the accents. I was really happy with the more subtle colors, and I wanted to make sure that the blue starfish were the stars of this show. Once the bracelet was complete, I went over the entire piece again, adding in peyote stitch and extra nets wherever it seemed fitting. Unlike most of the cuffs I make, this one has an overlapping clasp. I much prefer the seamless look for this piece, and I think I’ll strive for the same effect more often in the future. I am not a huge fan of freeform pieces, but that is awesome!! This piece is SCRUMPTIOUS! You really captured a nautical feel with this. I love it. This does indeed pulse with a beachy vibe. I love the subtle colors you chose to make up the "sand." It's great and feels very beachy. Love it! I love it! Good move deleting the blue and green beads, the starfish really stand out!! WOW, I've never seen anything as cool as this!! I really need to share! Do you mind if I mention it and link over from A Bead A Day? Hi, Lisa! Of course you are welcome to share! Please feel free to grab the pick code, too. And thank you! I like it Mortira. I think you took the right decision taking off the turquoise and green. Lovely colors and the design too.